Memoir of John William Draper, 1811-1882. Wahington : National Adademy of Sciences, 1886. Description : [1 l.] pl., 349-388 p. ; ill.: 1 phot. ; cm. Photograph : printed leaf with artotype portrait and signature. Subject : Medical biography — Draper, John William. Author caption: By George F. Barker. Appointed professor of natural science, Western University of Pennsylvania, 1864. Professor of physiological chemistry and toxicology, Yale, 1867-1873. Professor of physics and head of the department, University of Pennsylvania, 1873-1900. 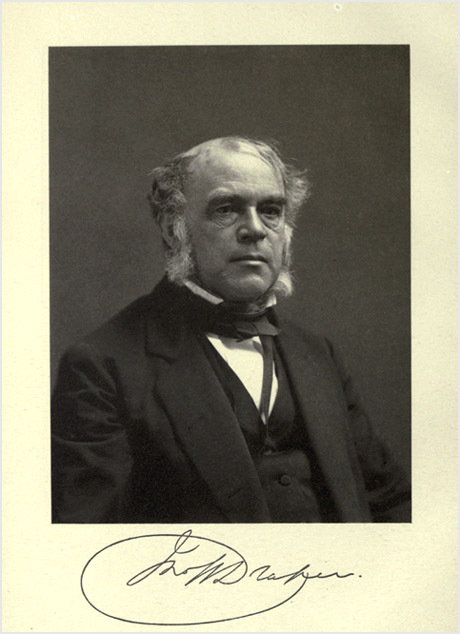 President, American Association for the Advancement of Science, 1879. President, American Chemical Society, 1891. Read before the National Academy, April 21, 1880. Offprint, National Academy of Sciences biographical memoirs. Vol. 2. Includes a complete bibliography of Draper's works. Photo caption: ARTOTYPE, E. BIERSTADT, N. Y. Some of the earliest of Dr. Draper's investigations were directed to a determination of the various forms of energy which exist in solar light. The chemical action of light was always a fascinating subject to him and he had made many interesting experiments to ascertain the effect of different kinds of light upon chemical change. These chemical actions were investigated in three different directions. The first of these was photography. For many years he had studied the action of light in changing the color of metallic salts, and he had already long been accustomed to apply the photographic process to the solution of physical problems when Daguerre's discovery was announced in 1839. He welcomed the daguerreotype enthusiastically, made a special study of it, and in the same year improved it so much that he took by its means the first portrait of the human face. —Page 363.